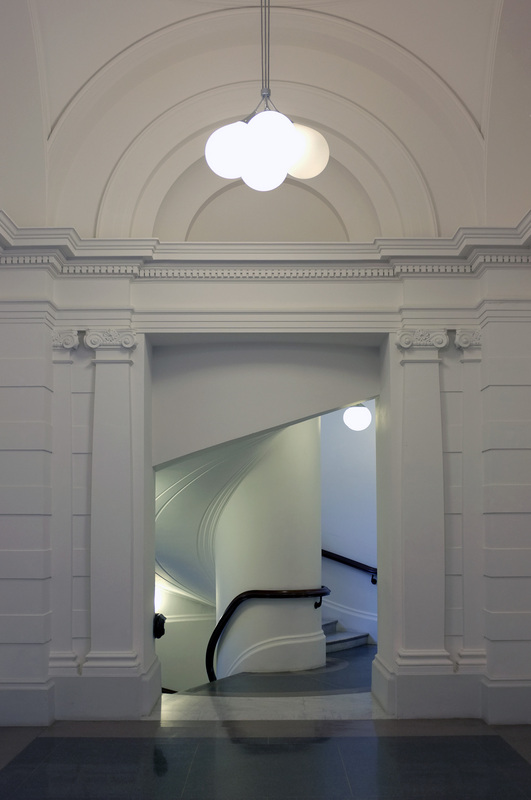 At the end of 2013 Tate Britain reopened the Millbank building following an extensive refurbishment by Caruso St John Architects. In 2001 a new, fully accessible entrance was created to the side of the original building, robbing the grand porticoed entrance of its primary function. Thankfully the impressive classicist (if a little brash) Thames-side frontage has been reinstated as the principal entrance, with the side entrance retained for secondary and disabled access. On the main floor the existing galleries have been skilfully restored and reunited into a cohesive enfilade of light-filled rooms, showing the Tate’s permanent collection, chronologically arranged from 1540 to the present. The lower floor has been completely reimagined. Existing, back-of-house areas have been opened up to create a suite of education and event spaces. The existing café and restaurant have also been refurbished. Previously the café had been a sad, dingy space – now it has been opened up to the façade and enjoys natural daylight. The existing rotunda forms the fulcrum of the new arrangement. At the centre of the space a new, generous spiral staircase has been dropped to the lower floor, providing a tangible link to the main floor and borrowing daylight from the rotunda. A scalloped pattern in the terrazzo floor has been pulled up into a perforated balustrade of polished cream and black precast concrete. The balustrade to the stair itself is in curved opal glass, framed in mirror polished chrome. The new stair gives more than a casual nod to Art-Deco style – and is a little glitzy for my taste. That said, it is entirely appropriate and has a very satisfying feeling of permanence and grandeur. The stair’s scalloped motif is picked up in details throughout the project, from the profile of the bespoke joinery to the apertures of the steel window grills. The Rotunda’s circular balcony, closed since the 1920s, has been reopened and transformed into a light-filled members lounge, accessed via another new stair in polished precast. This stair is much simpler and rather beautifully proportioned. It sits beautifully under the existing domed rooflight, and links all of the floors. Here, and throughout, lighting is provided by bulbous, milky pendants strung from the soffit on woven steel cables. In the foyer and lower floor these lights are bunched together in clusters, or held in polished chrome rings to form chandeliers. The floor finishes throughout show the same flair for pattern seen in their refurbishment of the Museum of Childhood in Bethnal Green; https://socialskillsarchive.wordpress.com/2013/03/10/museum-of-childhood/ . The new terrazzo flooring has been laid out in a variety of patterns in a range of greys, black and creams – with broad contrasting thresholds between rooms. Hopefully one day I will have the right client and budget to create floors like this! Far from the polychrome playfulness of the Museum of Childhood, the palette at Tate is restrained, almost monochrome. At first I wondered if an opportunity had been missed – but on reflection this bright and muted backdrop serves the art and the building well. It was interesting to discover that the colour scheme was derived from the original palette of the architect of the original building, Sidney R J Smith. 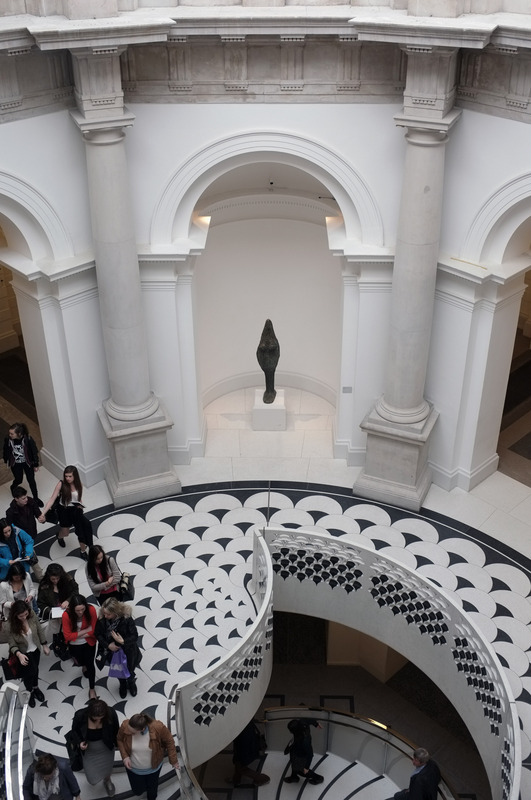 My favourite rooms of the reimagined Tate Britain are the galleries devoted to the works of sculptor Henry Moore (see below centre – Reclining Figure, 1951). There is also a beautiful Barbara Hepworth sculpture and a number of early Hockney paintings including one of my favourites, ‘A Bigger Splash’.